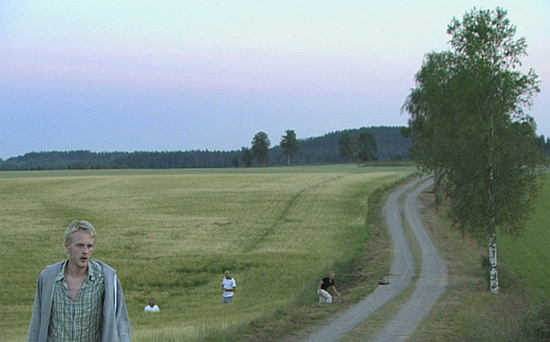 Ruben Östlund's first feature Involuntary defies classification, though it draws from the Nordic tradition of deadpan humour as an interlude to life's tragic course. Neither a linear narrative nor a docu-drama, it shares qualities with the DIY and experimental wave. In the end, it comes across as a piece of tightly choreographed observational realism. Involuntary is a continuation of the director's study into social psychology and the fragility of human behaviour, ingeniously explored in his 10-minute short Incident By A Bank, which won the Golden Bear at the Berlinale this year. It consists of five separate, disjointed stories that never intersect but build up an impression of people's behaviour under the influence of their environment. Östlund plays with a diverse range of characters – mainly non-actors - stripping them of their social facades. The film opens with a birthday party. Injured in a firework display, the host quietly gets on with the evening in order not to deflect his guests' attention from the show, and succeeds... until he is found prostrate on the ground. This disquieting opening scene sets up the film's main question: What does it mean to be so self-conscious, even in the face of death? The second episode in Involuntary sees a famous Swedish actress trying to save face after breaking a curtain on her tour bus. The disgruntled driver grinds the vehicle to a halt until the offender admits the deed. Following hours of delay, a young boy is pushed by his parents to apologise for his misdeed. Again, this is a remarkable psycho-sociological moment for study. How does a person's environment shape him to confess to something he has not done? Next, we see two teenage girls in front of a web camera experimenting with their imposed sexuality. Those scenes produce a slight discomfort, as the girls gaze straight into our eyes while performing – turning us into nasty voyeurs of an underage live action chatroom. The next chapter is also erotically tinted. Leffe is a guy who likes playing salacious pranks when drunk. During a weekend get-away with his male friends, he manages to get one of them into a compromising sexual position with surprisingly little difficulty - until the morning after, when the friend calls his girlfriend. It is an inquiry into repressed sexuality among those confined by society's norms, even when their mojo tells them differently. At this point in the film, it is becoming clear that the characters are defined by our own projections onto them. The last story in the loop involves a teacher invoking morality when a colleague acts violently towards a misbehaving pupil. In a short sequence half way through the film, the teacher demonstrates one of the 'Asch conformity experiments' in her classroom. These experiments, introduced in the 1950s by Solomon Asch, are applied to challenge 'the power of conformity in groups'. In front of the class, the teacher displays a picture made up of three lines, each with a different length. A student is asked to point out the shortest line. She does so but the rest of the class rowdily disagrees with her choice (they are in on the experiment). The teacher asks the student the same question again several times until the student opts for the most popular answer despite the clear visual evidence. So simple, yet so striking, this experiment is still applied in schools and its results never cease to astonish. In the narrowest of interpretations, it is just a bit scary how much we are affected by others and how deeply that determines our choices. But this is just one example of peer pressure. Most people could think of a hundred cases in which they said or did something because their friends or family expected them to. In Östlund's case, the selection of occurrences are in the end really sad, giving a feeling of predisposition, of confinement in your own skin by virtue of being watched. On the other hand, there is a danger with these stories that they appear too random and fragmented. They never interlink through character, but all deal in their own peculiar way with group mentality and normative social influence. I am sure that Östlund would approve of an ambivalent reception, this likely being what he was aiming for. For his camera style – often described as neutral, observational, and mainly out of action - ironically fails to be unobtrusive: the deeply knowing choice of unconventional angles and off-beat framing are stylistic tricks that feel measured. They succeed in detaching you from a traditional viewing experience, but they are also part of a systematic methodology which has been applied to provoke certain emotions. And that is surely discernible. Ruben confronts this when he speaks about the 'deliberation of the unconventional', with his uneven long takes that are designed to 'keep the viewer busy and make him ask questions'. This said, people will surely indeed be alive with questions after watching this film. It might make you wonder, for a while, what all the fuss was about, but its themes and scenes will haunt you for longer. For those who don't generally seek a 'clear, one-dimensional message', and detest Q & A questions like “But what did it actually mean?“, Involuntary is work worth checking out. A good exercise in open-endedness that will keep the mind busy.